In small non-aluminum saucepan, mix 1/2 cup sugar, lime peel, lime juice, eggs and egg yolk. Cook and stir over medium heat until mixture boils and thickens. Stir in food color. Cover; refrigerate about 1 hour or until chilled. Melt margarine in large skillet over medium-high heat. Stir in flour, 1/3 cup sugar and pistachios. Cook and stir 5 to 7 minutes or until mixture is golden brown and crumbly. Reserve 1/2 cup crumbs for topping. With fork, press remaining mixture firmly in bottom of ungreased 13x9-inch pan. Place in freezer for at least 5 minutes to cool. Spoon and spread half of ice cream over crust. Spread with half of lime mixture. Top with remaining ice cream; spread evenly. Top with remaining lime mixture. 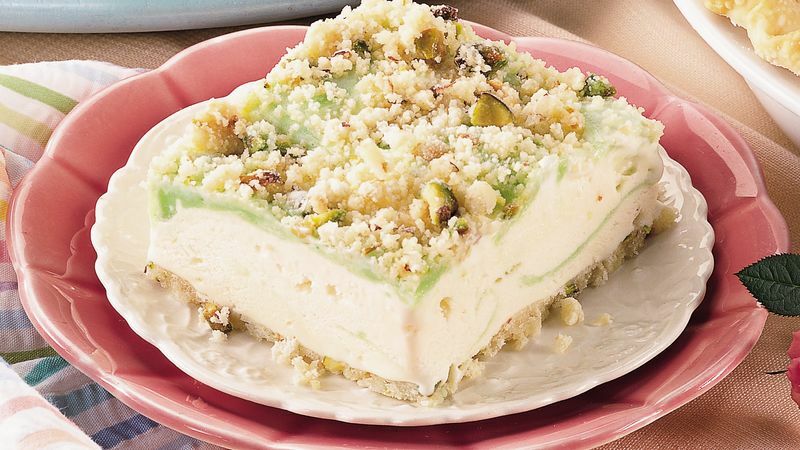 With knife, swirl lime mixture gently through ice cream, being careful to not disturb crust. Sprinkle with reserved crumbs. Cover; freeze 6 hours or until firm. Let stand at room temperature for about 10 minutes before serving. Cut into squares.